I have a lovely herb garden where I grow sage, thyme, lemon verbena, marjoram, oregano, chives, parsley and rosemary. The other day, I checked on my herbs (there was a bad storm and I wanted to make sure that my little darlings were ok) and discovered that my rosemary has grown larger than I thought. So, I needed to find a way of using a bit of the herb. 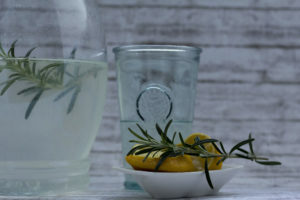 I hadn’t planned cooking that day but as I looked around my kitchen, I saw that I still had some lemons so I thought I make myself a nice little lemonade – don’t ask how my brain works as my husband wondered how a lonely lemon and overgrown rosemary make me think of lemonade. But that’s what happened. For a lemonade, you need sugar, water and flavouring. In this case, my flavouring is rosemary and lemon and the secret to a good rosemary lemonade is not to overdo it with the rosemary (I know, sounds weird) as this lovely herb can taste quite ‘soapy’ when used over-excitingly. The result was a lovely refreshing drink that wasn’t too sweet (depending on how much of the syrup you use) and had a tint of rosemary f lavour. Combine water and sugar in a saucepan and bring to a boil, stirring to dissolve the sugar. Add the rosemary, stir a bit to start the release of the essential oils in the rosemary and take off the heat. Leave to cool. When cold, add the lemon juice and stir to combine. Strain into a sterilised bottle and keep in the fridge for up to a week. To use, pour a little of the syrup (as much as you like) into a glass, top up with either still or sparkling water, add ice cubes and serve.